Patriarch of Moscow and all Russia Kirill will mark his 70th anniversary on November 20. MOSCOW, November 18. /TASS/. 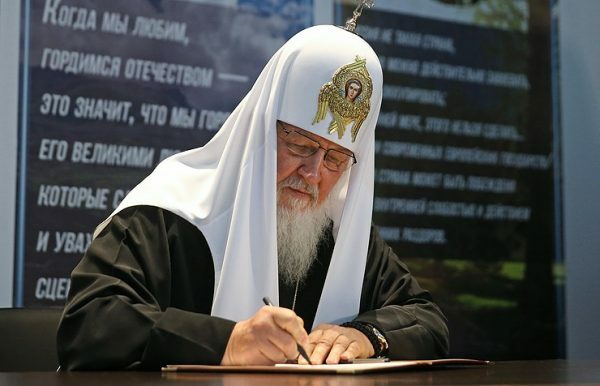 Patriarch of Moscow and all Russia Kirill I on Friday begins to receive guests in his residence in Moscow on the occasion of turning 70 years old, which he marks on November 20, the Reverend Alexander Volkov, the Patriarch’s press secretary said. In the period of up to November 22, His Holiness Kirill I will hold dozens of bilateral meetings. “The ruling hierarchs will take up the problems that top the current agenda,” the Rev Volkov said. The Reverend Igor Yakemchuk, the secretary for pan-Orthodox communications at Moscow Patriarchate’s department for external Church relations, said earlier the delegations of all the fourteen local Churches would arrive in Moscow to celebrate Kirill I’s 70th birthday. Specifically, the Russian Church officials are looking forward to the arrival of the Patriarch of Alexandria and all Africa Theodore II, the Patriarch of Jerusalem Theophilos III, the Catholicos-Patriarch of all Georgia Ilia II, the Patriarch of Serbia Irinej, the Archbishop of Nova Justiniana and all Cyprus Chrysostomos II, the Archbishop of Tirana, Durres and all Albania Anastasios, the Archbishop of Warsaw and all Poland Sawa, the Metropolitan of the Czech Lands and Slovakia Rastislav, and the Metropolitan of all America Tikhon. Each delegation will have a separate itinerary for sojourn in Moscow. He said along with it the Divine Liturgy that Kirill I would conduct on November 20 in the Cathedral of the Savior in downtown Moscow would become the central event of the celebrations. The Rev Volkov mentioned the special attention the media gave to the arrival the Catholicos-Patriarch of Georgia Ilia II. The 83-year-old supreme hierarch of the Georgian Church is the oldest Primate of a local Orthodox Church today but he took an unequivocal decision to make a trip to Moscow. On November 23, Ilia II and the Georgian clerics accompanying him are expected to chant a liturgy in St George’s church in Gruziny – a historical district where the Georgians coming to Moscow resided in the past centuries. “The liturgy will mark the feast of St George’s breaking on the wheel, which is a date highly venerated in Georgia,” the Rev Volkov said.